-> Pros & Cons. – From My View Of Point. -> Conclusion: Should we invest here ? There are many other ways to secure a loan apart from approaching a bank. You could borrow money from private lenders or take out a gold loan. If you need to invest money, you always look for ways that have the lowest risk involved. Borrowing or investing, both ways you face any hassles before any transaction is successful. You need not worry anymore as a new platform is now available called the P2P(peer-to- peer) such as the i2iFunding. So, What is I2Ifunding All About ? – The Best Solution for All Your Borrowing and Investment Needs !!! I2IFunding is a leading peer-to- peer platform for lending in India. It is different from the traditional methods of investment as well as borrowing. One can take personal loans from i2ifunding at an interest rate as low as 12%. On the other hand, investors can directly lend their money to genuine people and get high returns and their principal amount remains protected. Vaibhav Pandey is the mind behind this successful start-up i2ifunding. It is the best way for both investors and borrowers to fulfil their financial requirements using this smooth Peer-to- Peer lending platform. In this review, we shall learn how i2ifunding works for investors as well as borrowers and if this platform is best for your needs. As we have already learned, i2ifunding is a peer-to- peer platform. It helps investors invest their money and earn attractive interest rates. In the case of borrowers, they can get loans quickly after proper verification. This online portal verifies borrowers stringently and only verified borrowers are listed on the website. Investors can view the borrowers’ details with a filter option(image below) and choose if they are the right candidates to invest in. Investors can even choose to lend small amounts to different borrowers and diversify their investment goals. In India, P2P Lending is facing a slow growth, but gradually gaining traction. As this is a completely online platform, it requires less manpower and resources to run the business. It allows investors or businesses to meet the borrowers directly for further information. What makes i2ifunding a better choice over banks is the interest rate. A borrower can pay as less as 12% interest on the loans borrowed, whereas, an investor can earn about 30% interest with principal protection. This is way more than what the banks offer as well as hassle free. The RBI is already working on guidelines that will help in regulation of this sector. Thus, making it one of the most secure, stable and safe ways of planning your finances. You can read more about them on their official site of I2IFunding. How Does I2IFunding Work For Both Investors & Borrowers ? I2IFunding has a seamless process of operations. The entire process is completely digitalized and transparent. You can register at i2ifunding website for free. Just fill in your personal details and create a login ID. Your email and mobile number will also be verified during the process of registration. One registers, a relationship manager will be assigned to you. The relationship manager will work closely with you and help manage your account. • Create an Investor Account by filling the required details and submitting a scanned copy of the KYC. You will also be required to declare your income details. • Now, you will have to create an Investor’s Wallet tat contains brief information related to your profile. • An investor can invest in any one borrower or multiple borrowers as per their requirement. The investor has to check the key information of the borrower, i2i report, risk report, etc. before making any commitment. • Create a borrower account and fill in a one-time fee of INR 100. • With the help of the proprietary Credit Score Model, one can settle their minimum interest rate. This is recommended based on the credit risk report of each borrower. • A borrower can now post their loan requirement at an interest rate higher or equal to the i2i Recommended Interest Rate. The i2ifunding team does physical verification of both investor and borrower. Only after this, the team will allow the process of any loan online. This helps in ensuring all the legal documents, other formalities, etc. are in check, and only genuine people are enlisted on the website. 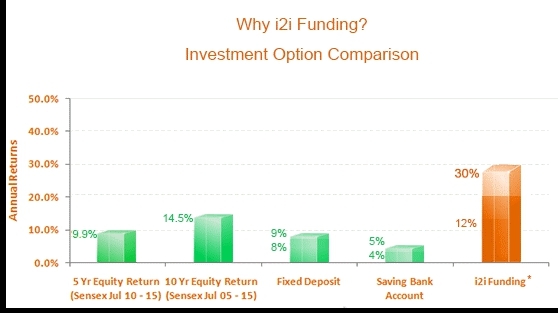 How Much Can You Invest on i2iFunding As An Investor ? Any investor can invest at i2ifunding.com. You can start with INR 5000/- and earn high-interest rate. Even your initial investment amount remains secured, making it one of the most risk-free forms of investment. 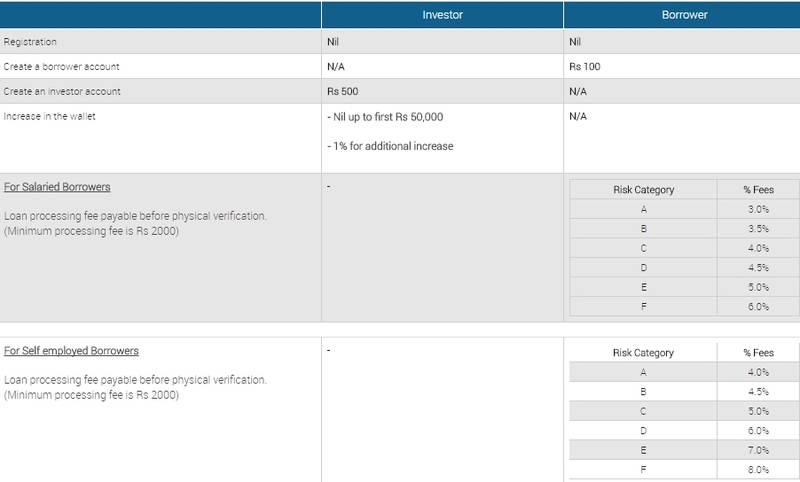 All investors are divided into different categories and each one receives protection based on their principal amount invested (please see image below showing the level of borrower risk category provided as a part of protection). What Type of Loans is Available on i2ifunding For Borrowers ? One can take loans via i2ifunding for many purposes. This includes loans for business or redecorating homes. Many even seek loans for marriage purposes or a child’s education. The i2ifunding team will make sure one gets loans at the lowest interest rates and the terms and conditions are easy to complete. One can even check the list of active borrowers and investors to understand the trends, interest rates as well as other parameters. Note: You can pay these fees and other charges through net banking, credit or debit card. Every transaction is well secured. Presently, the company and their services seem to be well promising and transparency lies in every part of their business. I couldn’t find any negative feedbacks against them rather than missing of live chat facility. But at the same time, you should know the good and bad side of P2P Lendings before you made an investment. The P2P lending platform offers a trustable path for borrowers to get instant loans. Genuine P2P companies like I2IFunding does the whole work for investors like they review & accept borrowers, they gather & process the payment, they track down all the late payments, they calculate your profits, etc…making investors job much easier. No prepayment penalties, no physical visit and low-interest rate for borrowers. An investor can get returns up to 30%. Provides paperless, secure and transparent online transaction for both investors and borrowers. Definitely, it is a risk. You can also join their partner programs just by registering an account with them. Refer any investor and earn lifetime commissions on every investment made by them. Highlighting part is that you can also refer quality borrowers and can win high commission too. Dashboard you will be getting is very ease and user-friendly, therefore, helping you to monitor and track your referrals in your account itself. You are also allowed to register both investors & borrowers from your own account as well. So Is I2IFunding Worth a Try For Both Investors & Borrowers ? Just keep in mind what I mentioned about P2P lending services pros and cons. Yes, Definitely! I2IFunding is one of the best Peer-to- Peer lending platform in India. Banks can offer loans at an interest rate of about 14%. But, borrowing loans from i2ifunding requires you to pay an interest rate as low as 12%. Over 40+ parameters are checked before a borrower profile is verified. Borrowers can directly borrow money from the investor and even be able to contact them directly. This helps in a smoother transaction and building trust between the two parties. The payment gateway is secured and guaranteed risk-free. i2ifunding does not charge extra or late fees in case one cannot pay the interest in time. It also allows one to prepay their loans at their convenience without having to pay any additional charges to the company. A verified borrower can get money within a few days of posting their loan requirement. Similarly, for investors, they can earn interest rate varying 12% to 30%. They can loan their money to borrowers without any risk of losing their principal amount. I2IFunding offers highest data security and safety standards that keep all the details of their verified investors protected and confidential. Before any loan becomes online, it is properly verified and completely analysed. Thus, investors can rest assured their money will be in safe hands. Conclusion: According To My Findings !!! I have shared everything in this I2IFunding Review. If you are looking forward to investing some money and earn high returns, then i2ifunding is the best platform. You can earn up to 30% (wow) of an interest rate on your invested amount. Those who want to borrow can do so at a minimum of 12% interest rate. Believe it or not, 12% is the lowest interest rate in the market on borrowed amount. No need to worry about penalties for failing to pay interest on time. Unlike banks, i2ifunding does not ask you to pay any additional charges or penalties. So go ahead. Invest or borrow via i2ifunding.com and enjoy hassle free financial transactions. Thanks a lot for reading my article about my detailed I2IFunding review!!! Do you want to read more articles? Or else any more doubts to clear from my part ? Just shoot it down, I will get to you as soon as possible. I will soon be featuring more reviews. Hope you don’t forget to share as well. Firstly, thanks for your share of this article. I love to traveling. I have read this content. This book explains clearly investors and borrowers to make money online. Its maybe better solution for your business. So, I suggest you can read this blog, before starting your online business. Now, I’ll share this post on social media.